For over three thousand years, from biblical times until the present, Jewish prophets, preachers, mystics, philosophers, and rabbis have been talking about, thinking about, teaching about, and writing about G-d. Now, for the first time, all of that talking, teaching, thinking, and writing has been condensed into one neat little package. Meet—G-d in a Nutshell. 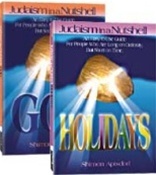 Leviathan Press has launched its multi-volume, Judaism In A Nutshell series with two titles, G-d and Holidays. Written by two-time Benjamin Franklin award-winning author Shimon Apisdorf, the G-d volume is a cross between a biography of G-d, a guided tour of the core philosophical and mystical elements of the reality of G-d, and an introduction to developing a profound relationship with the source of all existence. This book is unique on two counts. It achieves what would seem to require hundreds of pages in just ninety-six pages, namely, a summary of Judaism’s essential understanding of G-d in a remarkably brief format without sacrificing sophistication, and a genuinely thought-provoking presentation of ideas and concepts. This is no dumbing-down of G-d. Just the opposite—in clear, incisive, easy-to-read, and often humorous language, the author is able to present grand ideas without compromising depth or skirting the profound. If the G-d book is our "hello" to G-d, the new Holidays book would qualify as the "stick around and get to know Me" volume. It covers, in the same concise but penetrating format, the essence and meaning of what the Jewish holidays are all about—that is, developing our relationship with G-d, through once-a-year, specially designed encounters with Him. Don't miss either of these groundbreaking volumes! And be sure to keep your eyes open for upcoming titles in the series!